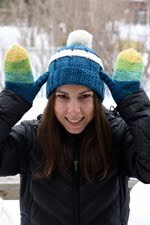 I've been wanting to knit the super popular Leyburn sock pattern for a while now. I have a couple skeins of multicoloured sock yarn that needed to be matched up to the perfect project, and I think that this is definitely it. This is BFMA Socks that Rock lightweight in the Seastone colourway (not available at the moment). To tell you the truth, it's a little nuts. Somehow in the photo the sock looks calm, very colourful, but reasonable. In real life they are screaming bright! I think it's the yellow that's a tad overwhelming in this colourway. The blue, green and purple all play together nicely, but the yellow really stands out. It's all good, I think my sister likes to make a statement with her socks, so these may get gifted to her. I've got a couple slightly more subdued skeins of STR in the stash that will make great Leyburns. I think that this is a perfect pattern to yarn pairing. It's so hard to find a good pattern for variegated yarns, this one definitely fits the bill. Before I could cast on for socks, I had to finish my Flower Girl Cardigan. And I did! It's lovely and adorable and sparkly and all the things I thought a Flower Girl needed for her big day. My cousin's wedding is this coming weekend, hopefully I'll get some good shots of Abby wearing it. I don't remember when exactly it happened, but sometime, a little while back I made a couple blog-friends. That's definitely one of the coolest things about blogs, you get to know people by reading their blogs, they get to know you by reading yours, or even if you don't have a blog, they get to know you through your comments. Back when I was still new to the blogging scene I came across Glenna's blog and quickly became a big fan. She's always knitting interesting things and is just so clever and witty that her posts are always fun to read. She also has a leaning towards blue, which I can't fault her for! When I discovered that she was knitting with my yarns I was thrilled! I really liked it when I saw the work in progress shots, the textures moss stitch panels, the cables, the attention to detail, it was all looking great. When I saw the finished product in person at the K-W Fair, I was floored. 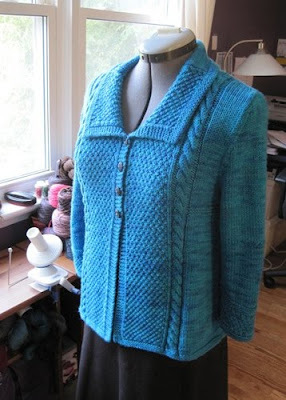 Glenna is such a great knitter, you should see the inside of this jacket, the finishing is perfect! I have a couple favorite things about this design. Like the details I already mentioned, I also love how the back of the collar is plain knitting but the front is textured. I love the 3/4 length sleeves with the moss stitch "hem". It's hard to see in the photo's, but there is a row of garter stitch that defines the bust line that I find particularly clever. I have high hopes for my own Rendezvous Jacket. It's definitely on my Fall knitting list, I think I'm going to knit mine in Shadow. This is the first of (hopefully) several designs by Glenna for Tanis Fiber Arts, she's cooking up a couple other ideas now and I can't wait to see what comes of them. This could be the beginning of a beautiful friendship. 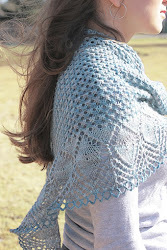 To purchase your own copy of Rendezvous, visit Glenna's Ravelry store. This morning I got up and checked my e-mail while I drank my morning coffee like any other day. But what a surprise I had waiting for me in my inbox! 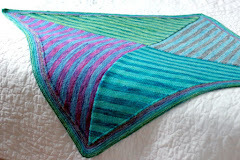 Loads of positive comments on my Baby Shane Blanket! I wondered why all of a sudden people were looking at it, and soon discovered that a huge honour had been bestowed upon me... Kay over at mason-Dixon knitting had not only seen the blanket, she liked the blanket AND she gave me a shout out on her awesome blog! What a thrill! I know my colourway names aren't particularly inventive, but I prefer to keep them simple and clear. Thanks to all those who visited my blog and left such lovely comments. If you'd like to make your very own Baby Shane Blanket, now you can! Today is my little brother Vincent's birthday. He's 24 years old today and I'm hoping that his day is very happy! He wrote a really great post about my family on his blog this week, check it out to see what the rest of my clan was up to last weekend. I wrapped up a couple lingering projects on the drive to and from Kitchener last weekend. The first finished project had been sitting unfinished in my knitting basket for, oh only about 2 1/2 years! I had one sock and most of the leg of the second sock done. I tried the finished sock on before I left and noticed that it was super comfortable and vowed to finish it's twin. And I did! I also finished my second Vespergyle mitten, the pair will make a great gift for one of the guys in my life this Christmas. My Kureyon Sock yarn cardigan is still hanging out in the basket... I will finish it soon, it's just missing sleeves and some finishing, but I've got a more pressing project on the needles right now. I'm making a cardigan for my goddaughter Abby. Abby's godfather is my cousin Sean. Sean is getting married this October, and then I'm getting married next June, and of course Abby will be the flower girl at both occasions, and she needs a pretty little cream cardigan to wear in case it gets chilly. 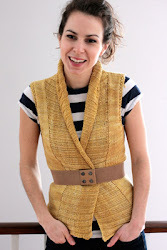 I'm knitting the Playful Stripes Cardigan, ironically without the playful stripes part... 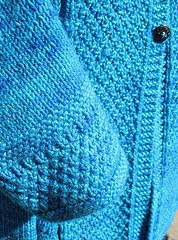 I'm knitting it in Sirdar Snuggly Baby Bamboo. It's a really lovely, soft, slightly shiny yarn. And because I can't get enough of the sparkles these days I'm jazzing it up with some sparkles over the garter stitch portions. The picot edge is a really nice detail too. Simple and classy. Abby will look great! If you've visited this blog before, you can probably guess that the last one is a personal fave of mine. I love blue! For those of you who can't make it to Kitchener this weekend, I've got my Kits for sale on my Etsy site. This too will make it to my Etsy site soon. But not yet! In other mitten news, I'm working on a pair of Verspergyle Mittens with my two new colourways, Lemongrass and Deep Sea, both colours will be accompanying me to the show, available in all 4 weights of yarn. 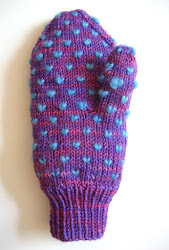 I really like the pattern, I predict I'll be knitting a couple pairs of these before Christmas. And Lastly, here is the last of my wonderful mom's summer knitting projects. She knit a great pair of socks in my Blueberry colourway, they will be on display in my booth, along with my mother, this weekend at the show. Wish me luck! I've got a bit more running around to do and then bright and early tomorrow morning we'll be hitting the road. Hopefully I'll see a lot of you there, and if you won't be there, I'll have a full update early next week! I'm just about all set for the K-W show. All the dyeing is done, almost everything is labeled and I have a pretty good idea of how I'm going to set up the booth once we get there. I'm going to be bringing 3 types of roving with me, Superwash merino, BFL and Tussah silk. I love them all. The superwash merino is so soft and absorbs the dyes so the colours are intensely vibrant and richly saturated. The BFL is soft and wooly, the colours are a bit more muted and natural, great for felting and the long staples make for easy, pleasant spinning. Ah, and then there is the tussah silk. I'm in love. It's so rich and silky and shiny and luxurious. I tried to capture some of it's sheen in the following photo's, but it's really something you have to see and touch in person to really appreciate. You may not be able to tell, but it's actually glowing. It's almost too nice, because I'm secretly hoping that not of it sells so I can keep them all to myself. Probably not very productive. Obviously I'd like to spin it all, but even in it's at rest state just waiting to be braided it's a sight to behold. 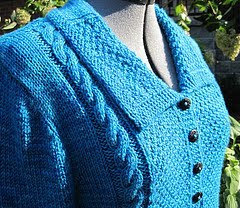 Another project that my mom worked on for me this summer is a lace weight version of Brooklyn Tweed's Girasole. She knit it on 3.25mm needles using just under one skein of my Pink Label Lace Weight yarn in the Jewel colourway, (there were 15g left.) It was tough to get photo's of because I didn't have a white sheet handy to lay the shawl on, so I used a white board but couldn't fit the entire shawl on it... I'll try to get some better photo's soon, it's lovely and drapey and these photo's do not do it justice. As you can see, my mom is clearly a very clever knitter. She used to knit a lot, I've even got some of her old sweaters to prove it, but then she had 4 kids and apparently that's enough to really get in the way of ones knitting time. Which makes sense, because I don't recall my mom spending much time sitting around twiddling her thumbs, she was always on the go, doing stuff with us or for us, bringing us places or picking us up. It's really nice now that we're all grown up she's finding a bit more time to spend doing things for herself. Although knitting samples for me might not exactly qualify as doing something for herself... Although I promise to give this back to her after the show, I may have to borrow it again for the next one! Hopefully her next knitted project will be something she won't have to share! Everything I know I learnt from my mom. Luckily, she's taken up knitting again. I like to think my influence had a little something to do with it. This summer, before she left for the cottage she packed a couple skeins of my yarn as well as some patterns and kept busy all summer long. She knit this gorgeous Woodland scarf out of my Blue Label yarn in Stormy. It looks great, and will be perfect in my booth at the K-W fair to show people just how far one skein of sock yarn will take you. It's not very wide, but it's the perfect long skinny scarf for Fall. The problem with knitting such lovely samples is that I just know that I'm going to want to wear this scarf come Fall, and then the next time a show comes around I'll have to get my mom to knit me another sample. Its a vicious cycle! But I have a feeling I'll like it even more if I come home from the K-W show and my shelves are empty because I've sold all my yarn! Today I dyed a ton of roving, superwash merino and BFL, I'm almost ready! I have a friend who loves slouchy hat's, so this may get gifted to her.